Good morning and a hearty welcome to you! It's Monday and I have a new Meal Prep post for your delectation. One evening I just could not be bothered cooking but still wanted something reasonably healthy, so I Uber Eats'd a chipotle chicken salad from a local Mexican chain. It was neither great nor terrible, and slightly expensive, but I didn't have to do any dishes and didn't fall into a carb-coma afterwards so overall I'd say it was a win. However, I couldn't get the idea out of my head that I could make a better salad if I just applied a little effort once I was feeling more energetic. So I did! 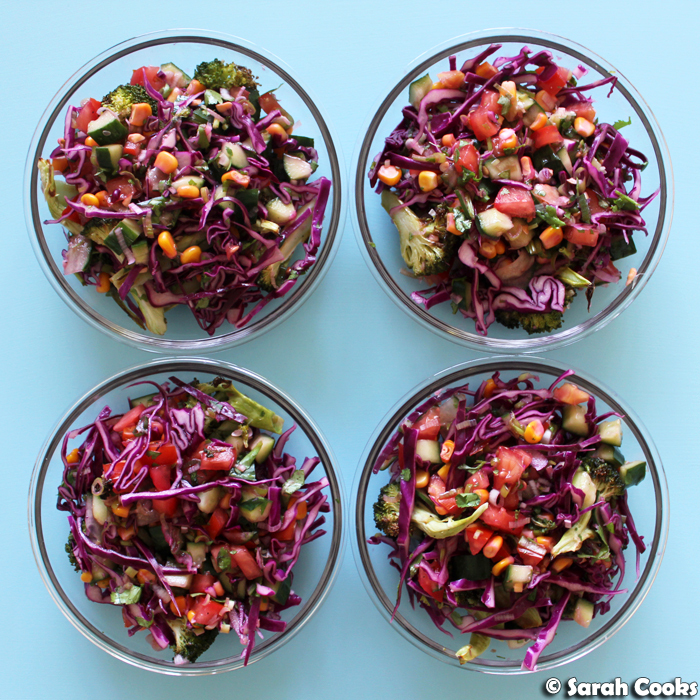 The next night for dinner, I threw together a salad with lots of fresh raw vegetables, plus corn, roast broccoli, lime juice and coriander. (There were, like, three tiny pieces of roast broccoli in the salad I ordered, and I wanted MORE). 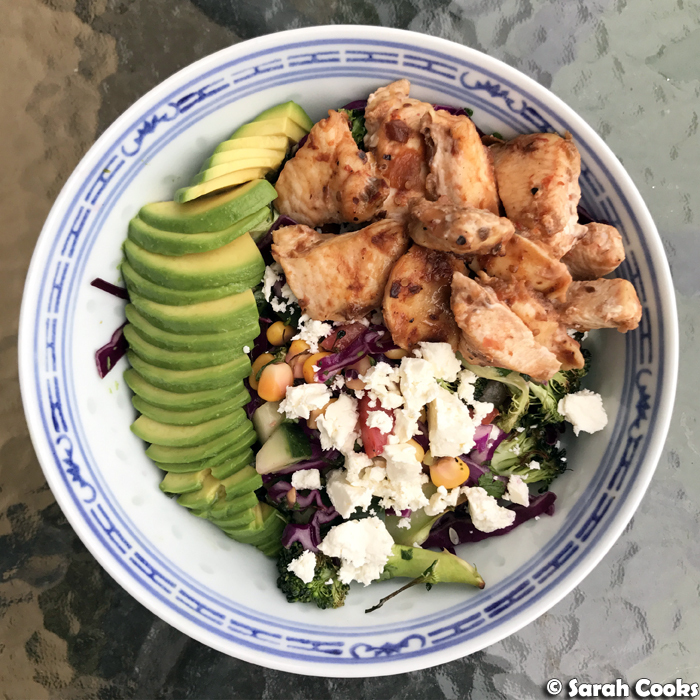 I topped the salad with feta and chipotle-marinated chicken. Plus avocado, of course. And it was so good! All the vegetables were so vibrant and tasty, and it was a really nourishing-yet-light meal. Perfect candidate for meal prep! Feeling energized by my successful salad endeavour, the day after that, I went out and bought more ingredients, whipped out the camera and made four days' worth of those salads for my work lunches. 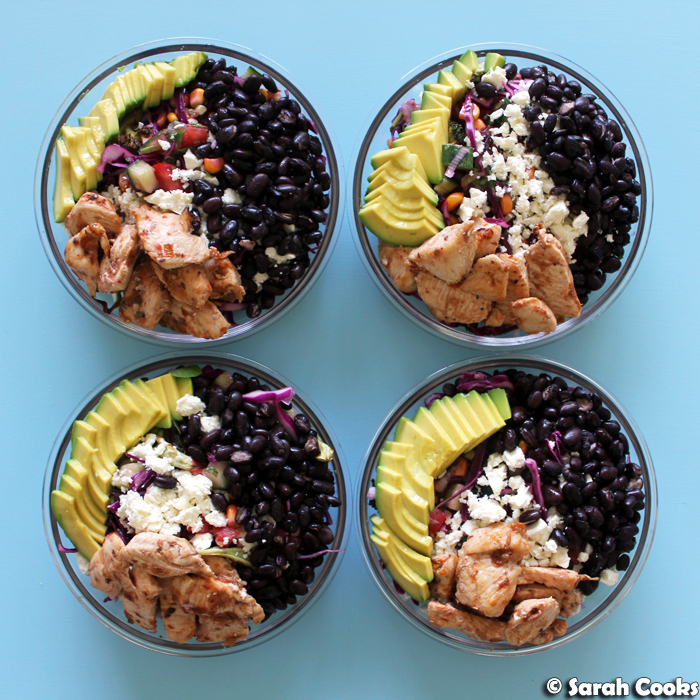 And here we go: chipotle chicken rainbow salad! (I do realise this means I'll have been eating a chipotle chicken salad for six days in a row, but I'm ok with that). So, the chicken. I found that one large chicken breast was enough for the four bowls - but obviously use more or less depending on your appetite. As a marinade, I used that same Frontera chipotle salsa that I told you about for my last Mexican Meal Prep. I bought it at a local McCoppins gourmet grocer and totally love it, but am sadly not sure where else it would be available in Australia. However, you could use whatever seasoning you want - all that matters is that you enjoy the flavour of it. How about some supermarket taco or burrito seasoning; a hot sauce; maybe whip up some chipotle peppers in adobo sauce; or go real simple with cumin, chilli powder, garlic powder and some olive oil. I cooked the chicken and broccoli at the same time, on different shelves in the oven. For this, you just cut them into florets, drizzle with oil and salt and pepper, and roast. ... and then start to go dry and pop and split. They smell great while you're doing this! (Heads up - the pan is murder to clean up afterwards. 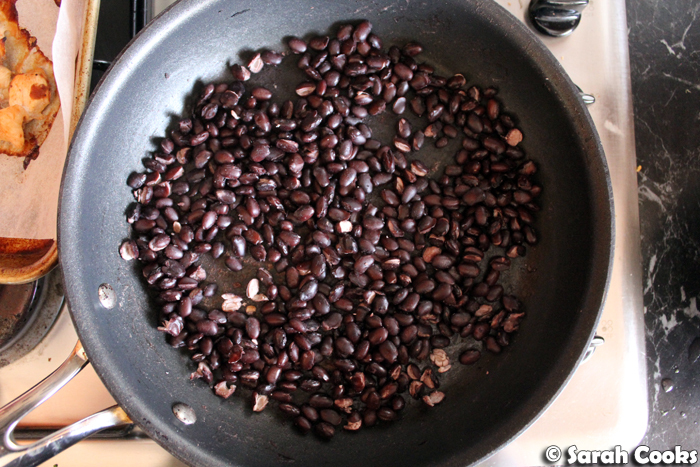 Your call if you want to try popping them or just use the drained beans as they are). Ok, let's look at the salad component of the salad. We're going for a Mexican vibe with lime juice and spring onions, then finely shredded red cabbage, corn kernels (from a can, I'm not Superwoman), fresh cucumber. tomato and coriander leaves. I love the bright colours! (Iceberg lettuce might be nice if you were eating this straight away, and you'd get that fun Tex Mex / Old El Paso / Taco Bill vibe, but seeing as the point is to eat this salad over a few days, cabbage is a better choice, as it holds up better). Actually, speaking of the corn - if you are feeling energetic you could toast the corn kernels in a dry frying pan to give them a slight smoky BBQ flavour before adding them to the salad. 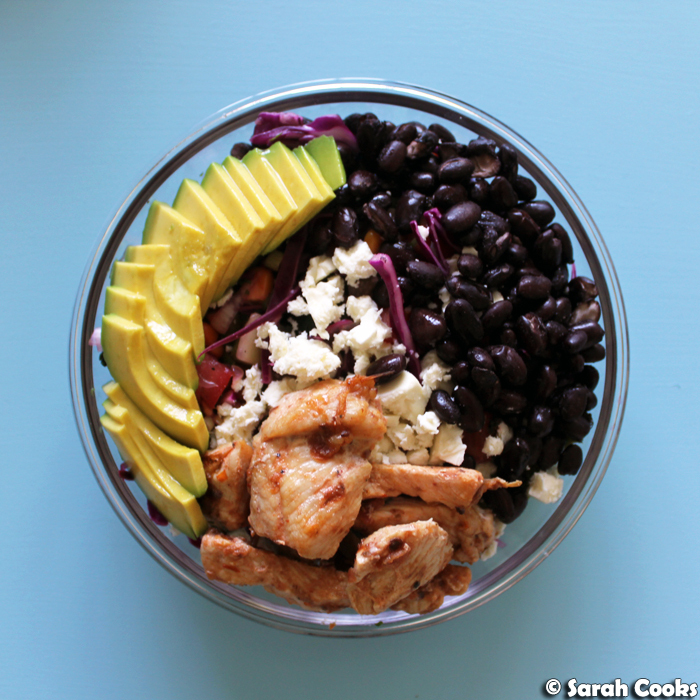 (Less messy than the black beans, I assure you). Or, of course you could barbecue a whole ear of corn before cutting the kernels off. If you are, indeed, Superwoman. Then your (popped or not) black beans and feta. (I like feta because it tastes awesome and kinda looks like what I imagine queso fresco looks like, but I reckon regular grated tasty cheese would be nice too - again channeling more of a TexMex vibe). Then chicken and avocado! Yummeh. I prefer sliced, guacamole is the obvious substitute. I've had people ask me before how I keep avocado from going brown over a few days. Answer - fresh unbruised avocado, lots of lemon or lime juice, air-tight container. Also, I don't mind if the avocado starts going slightly brown by the fourth day. If this bothers you, I'd suggest prepping all the salads at once, but only slicing each portion of avocado the day you eat the salad. Keep the unsliced avocado halves in the fridge in a zip-lock bag to maintain as much freshness as you can. However - when I meal prep, I don't want to be going back to the meals and doing more work throughout the week, I just want them done and dusted! I want to clean the kitchen, get everything out of the way, and then not think about the meals again until I pull them out of the work fridge and then inhale them. (And I must admit, I do like the way it looks when all the four meals are complete and I can take a nice photo of them for the blog or the Insta). Preheat the oven to 220C (200C fan forced). 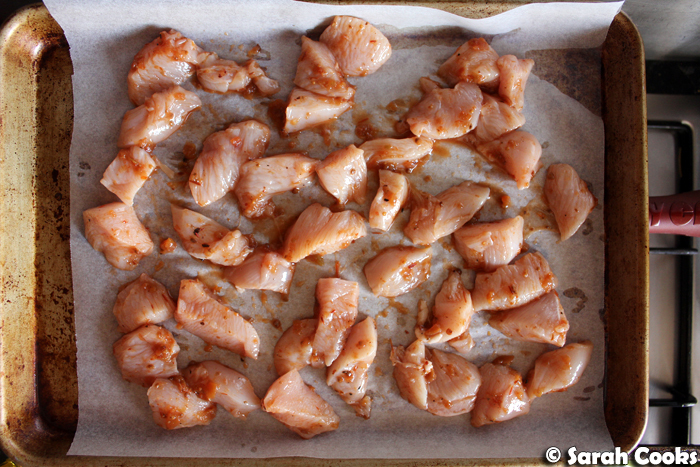 Place the chicken breast pieces in a bowl. Add the chipotle salsa and stir to combine. Allow to marinate in the fridge for an hour if you have time, or just tip straight onto a lined baking tray. 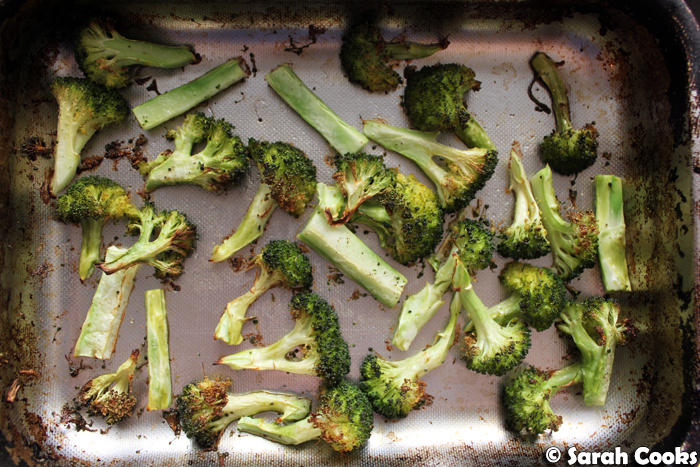 Place the broccoli florets in a separate baking tray. Drizzle with olive oil, salt and pepper and stir to combine. Roast both the chicken breast and broccoli in the oven for 10-15 minutes, or until the chicken is cooked and the broccoli has started to brown and it smells amazing. (Depending on your oven you might need to take one tray out first and/or swap them during the cooking time). 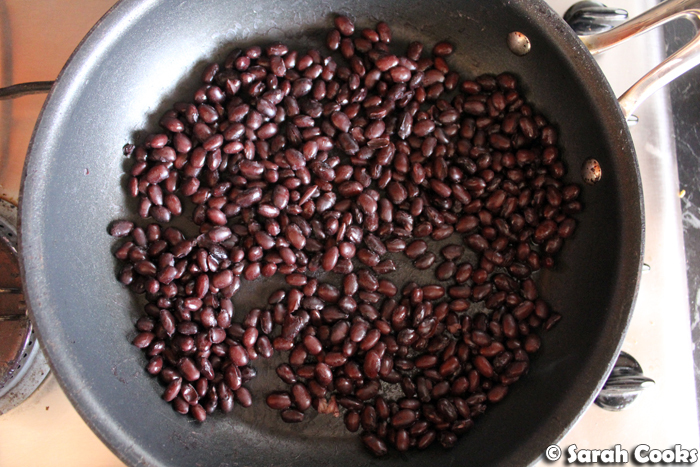 Drain the black beans and toast in a dry frying pan until heated through and some of them have started to pop. Take off the heat and set aside. Place the chopped spring onions in a large mixing bowl. Squeeze half a lime over and season with salt and pepper. 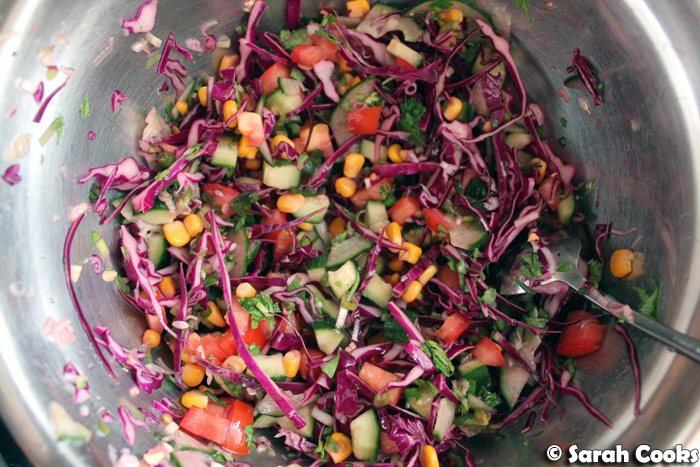 Add the red cabbage, corn, cucumber, tomato and coriander. Stir to combine. Divide the salad between four bowls/containers. 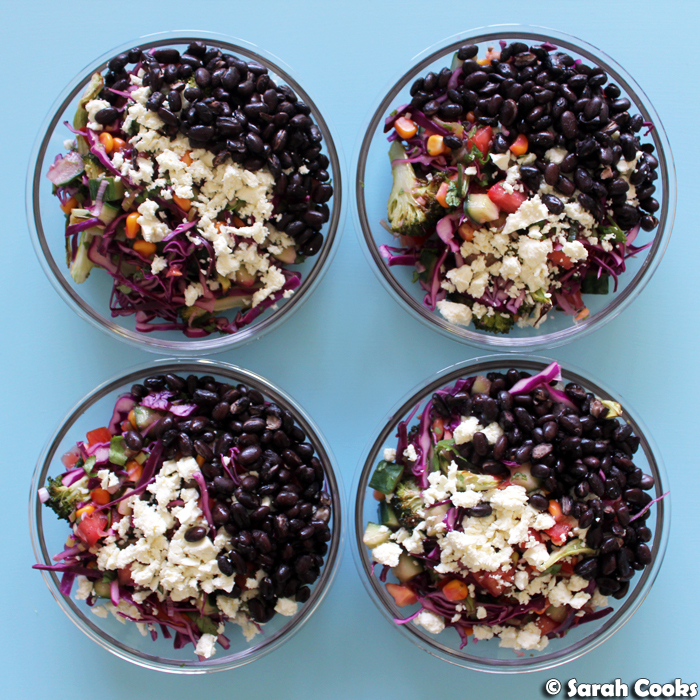 Crumble the feta over the bowls. Top with the black beans and chicken pieces. Finely slice the avocado and divide between the bowls. Squeeze extra lime juice over the avocado to prevent it from browning. Hi - USA Foods in Moorabbin normally has the Frontera range. It's a fun place to visit.